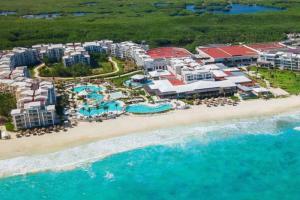 Set along 2,600 feet of pure crystal white sand and refreshing azure waters, combining understated sophistication with Unlimited-Luxury amenities, Now Jade Riviera Cancun offers the perfect escape for couples, families and friends. Now Jade Riviera Cancun features 550 ultra-comfortable suites, each inspired by the turquoise sea and Cancun's mesmerizing sunsets. Half-hour drive from Cancun, located beachside. Capers, Carnival, Castaways, Coco Café, Cin Cin, Mercure, Spice, Tamarindo. Akumal, Playa del Carmen, X-Caret Eco-Archaeological Park, Xel-Ha Eco-Aquatic Park, Tulum Mayan Ruins.